Elkton is surrounded by many beautiful natural resources from our vast Douglas fir forests to the meeting of Elk Creek and the Main Umpqua River. Elkton is a unique and breathtaking city. 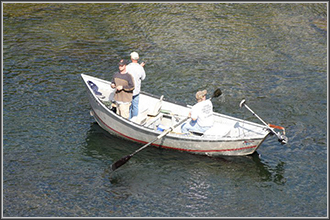 From the famous Umpqua River to the Butterfly Pavilion, the City takes pride in its unrivaled attractions, renowned Smallmouth Bass fishing, and its unique neighborhoods which are treasures of its own. 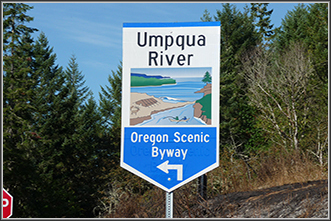 Discover the variety of outdoor recreation and scenic beauty that reflects the Jewel of The Umpqua. Our town is located at the junction of State Highway 38 and 138, just 42 miles from the ocean beaches. Eugene is 54 miles to the northeast and Roseburg is 37 miles to the southeast. Both offer colleges, cultural activities and excellent shopping and medical services. As you enter town note the award winning bridge with hand-carved tree posts at each corner. 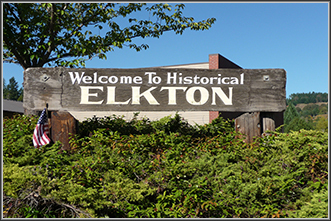 Elkton is a small,historic town, overlooking the beautiful Umpqua River and nestled in Oregon's coastal mountains. Here 200 residents relax and enjoy a peaceful life. Pastured valleys, rolling hills, vineyards and Douglas fir forests surround the city. Click here for current weather conditions!